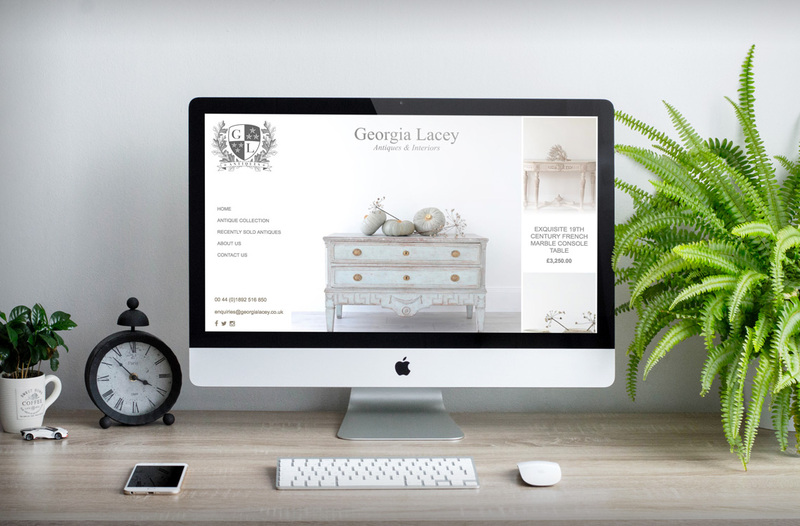 Georgia Lacey Antiques & Interiors recently revamped their website with Graceful, one of our latest theme releases. Read on to find out about their new theme and some of it's new features. Georgia Lacey Antiques & Interiors was established in Royal Tunbridge Wells five years ago by Georgia and her husband Marc, specialising in fine Swedish painted antiques and European decorative objet d'art. Georgia hands picks every piece of furniture on her regular trips to Sweden, placing great emphasis on sourcing items of quality, exceptional form and exquisite patina. Prior to establishing her Swedish antiques business, Georgia spent 20 years working as a freelance stylist and set designer, collaborating with some of the world's most influential magazines including Vogue and Vanity Fair. Georgia Lacey Antiques & Interiors have been with Antiques Web Design for more than 4 years now and were using one of our original design themes. After wanting to give the website a new lease of life, they changed over to the theme Graceful, which has transformed the website completely and makes great use of their fantastic product imagery. They have created a beautifully simple and minimalistic, yet image-rich website which encapsulates their brand perfectly! We can help you sell online easily too! We have been helping antiques, vintage and art dealers sell online easily since 2004, and we can help you too. As well as a hand held service, all our customers receive a copy of our marketing tips book which gives you lots of tips and advice on this on how to succeed online. We are a team of 5 hard working creative, technical, and client focused individuals. We're big enough to deliver, yet small enough to care and get to know each client individually. From providing you with a beautiful website, to personal courses & training on how to take great photography and excel on social media; we can help you sell online easily. "ph9 made it a very easy experience for us"
* Some features are only available with selected plans. Lifetime warranty subject to monthly fee.